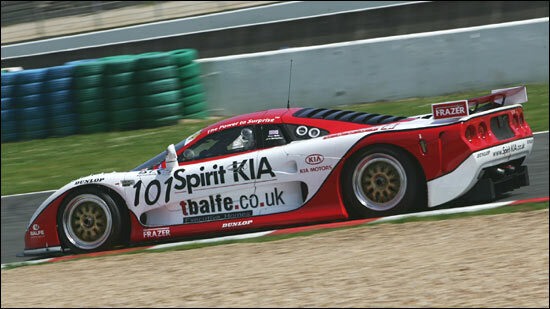 The Balfe Motorsport Team heads into its ‘home’ race of the 2005 season this weekend (May 13-15), in round three of the FIA GT Championship at Silverstone. The Newark Glass Group, KIA Spirit and Spirit Volkswagen-backed driver pairing of Jamie Derbyshire and Shaun Balfe will once again be taking the fight in the GT2/G2 category of the series to the factory supported Porsches, which, so far, have been the cars to beat. However, the Mosler MT900R has been the best privateer car in qualifying so far this year and a good result on home ground is what the team is aiming for. A non-classified finish at the opening round at Monza started the team’s season, with a mechanical problem forcing it out of round two at Magny-Cours in France just a fortnight ago. The pace of the Mosler has certainly not been in question. However, the team is hoping for a turnaround in fortune at Silverstone. “We’ve suffered our share of bad luck so far this season and a run to the flag without any problems is what we need this weekend,” added Jamie Derbyshire. “We’ll be aiming to chip away at the advantage the Porsches have over us at the minute and in effect it’s our home race, even though it’s a British team running the Porsches too.